Burnham questions Corbyn's policies Jump to media player Another of the Labour leadership candidates Andy Burnham has launched an attack on Jeremy Corbyn saying that Mr Corbyn's plans "lack credibility"
Labour leader campaign 'a mess' Jump to media player As the battle over who should become the next Labour leader enters its final stages, the party's former director of communications has described the leadership campaign as "an unedifying mess". Labour hopeful Cooper attacks Corbyn Jump to media player Yvette Cooper has launched a strong attack on her Labour leadership rival Jeremy Corbyn. Cooper attacks Corbyn's 'old solutions' Jump to media player Labour leadership candidate Yvette Cooper says rival candidate Jeremy Corbyn is offering "old solutions to old problems". Labour leadership: One month to go Jump to media player The Labour Party is preparing to elect its next leader after thousands of new members signed up to vote. Call to halt Labour race 'ridiculous' Jump to media player MP Diane Abbott has described fellow Labour MP Barry Sheerman's call to pause the Labour leadership contest as 'ridiculous'. 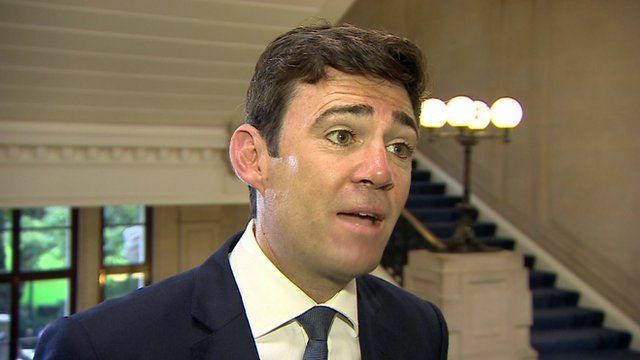 The Labour leadership contender, Andy Burnham, has launched a direct attack on his rival Jeremy Corbyn - saying he's failed to explain how he'll pay for his ideas. Left-wing back bencher Mr Corbyn continues to be the bookmakers' favourite to become party leader in September. The shadow health secretary told the BBC that Mr Corbyn's plans lack financial and economical credibility.